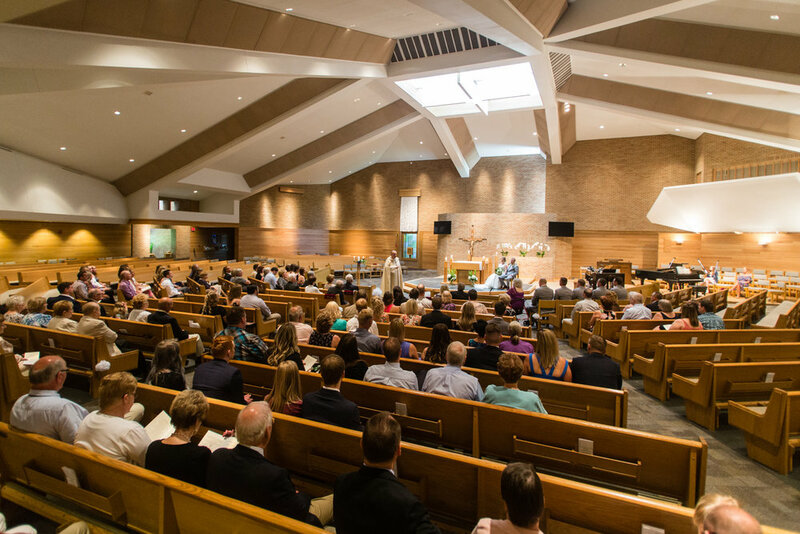 "Ceremony at St. Anthony's, Followed by Trolley Ride & Photos in Downtown Grand Rapids, With a Reception at Boulder Creek Golf Club"
But that's too much for a title of a post. 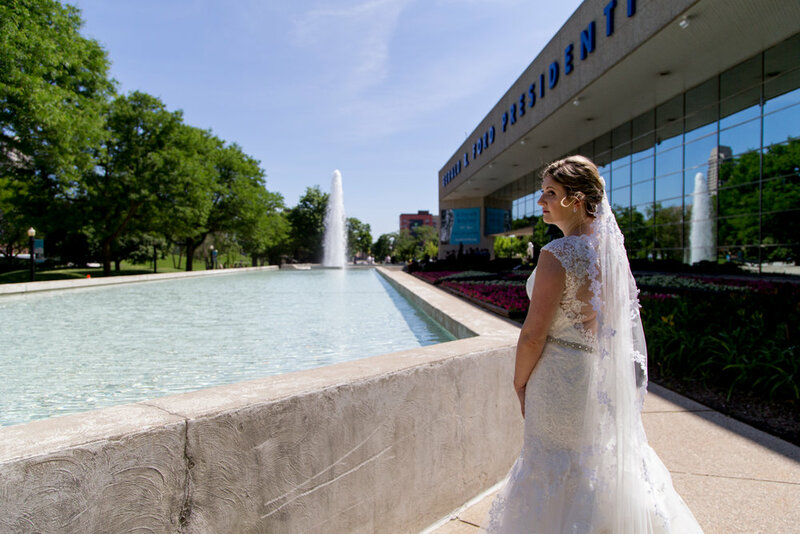 Jeff and Megan's wedding day had it all: details, bride and groom first look, Catholic ceremony, family portraits, trolley ride, multiple downtown locations, photos on the golf course, a great meal and fun on the dance floor. 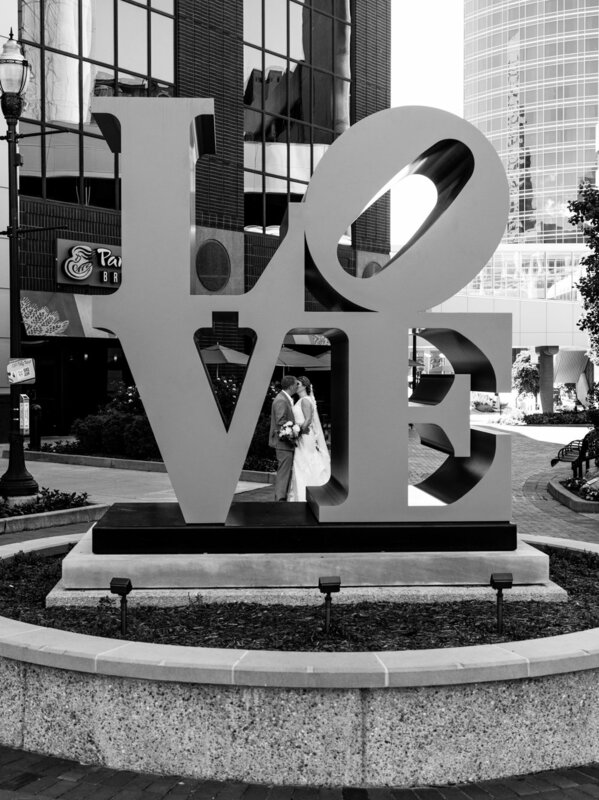 We connected with these two after they inquired about a session we were giving away and were game to be the couple who was part of our ArtPrize Engagement session in Grand Rapids. Meeting them we knew immediately they were perfect for each other. Each had spent time dating but not finding "the right one" until they connected via Facebook Friend Request (yes, it really did work). They dated, fell madly in love and were now making it official by becoming "Mr & Mrs". 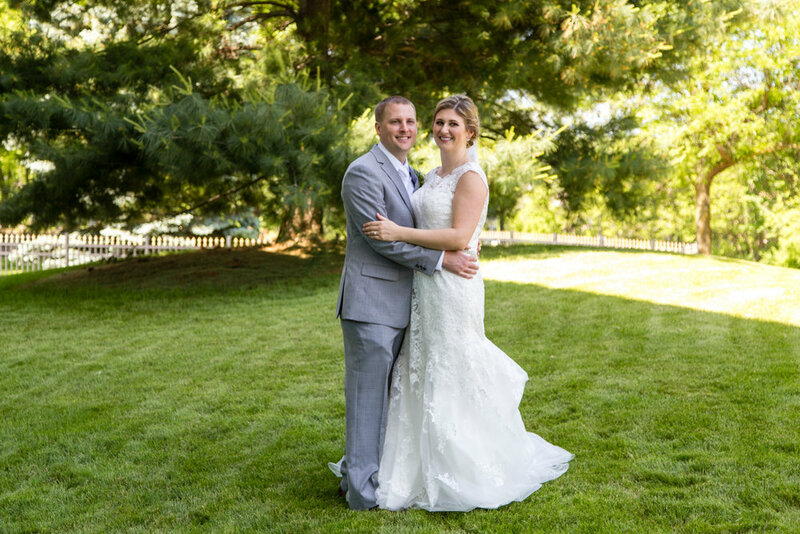 We wanted to make sure Jeff and Megan felt comfortable and confident on their wedding day. Not only did these two look great, the day couldn't have gone any better. We were just blessed to be a part of it. 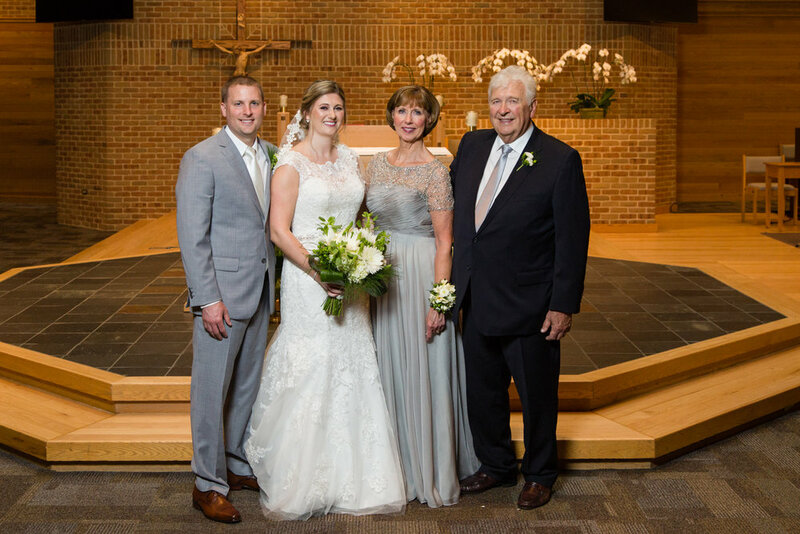 As Megan got ready, her time with her mom, dad and bridesmaids were moments to cherish. 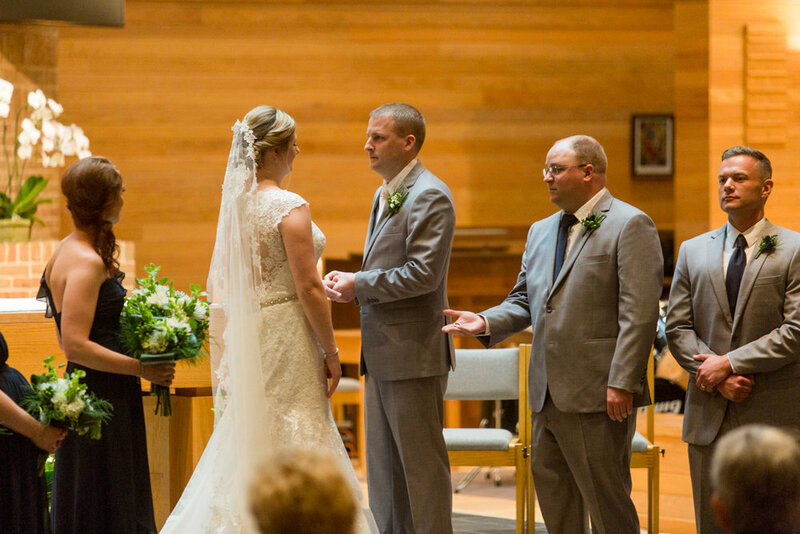 From wearing her mom's veil to not seeing her dad until just before the ceremony, the orchestration of all of Megan's details were phenomenal. During the wedding day planning process, we usually talk about whether the bride and groom are interested in a "first look." "Will either one of your (or perhaps both) be extremely nervous on your wedding day? Do you imagine having not just butterflies in your stomach, but anxiety?" If one of the two answers "yes", we recommend a first look. 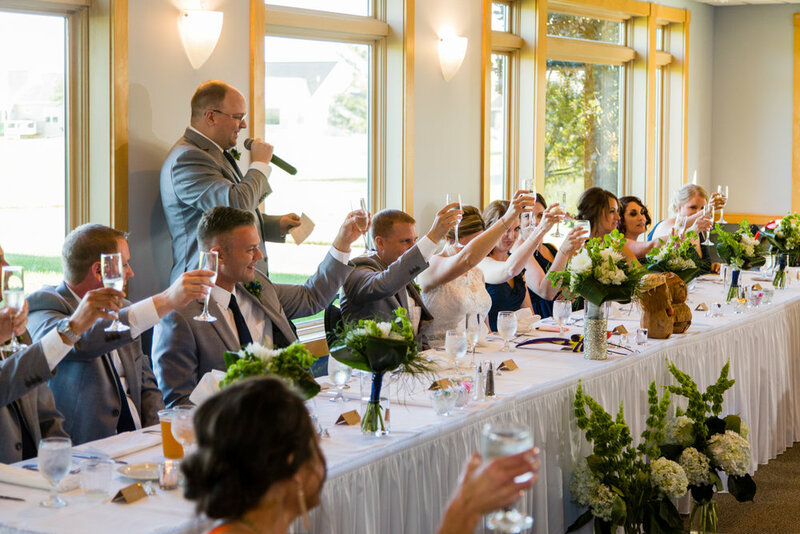 Because it provides the same level of intimacy between the bride and groom while helping to relieve the anxiety they feel about their wedding day. Jeff and Megan have become best friends as they've gone through the dating and engagement process. 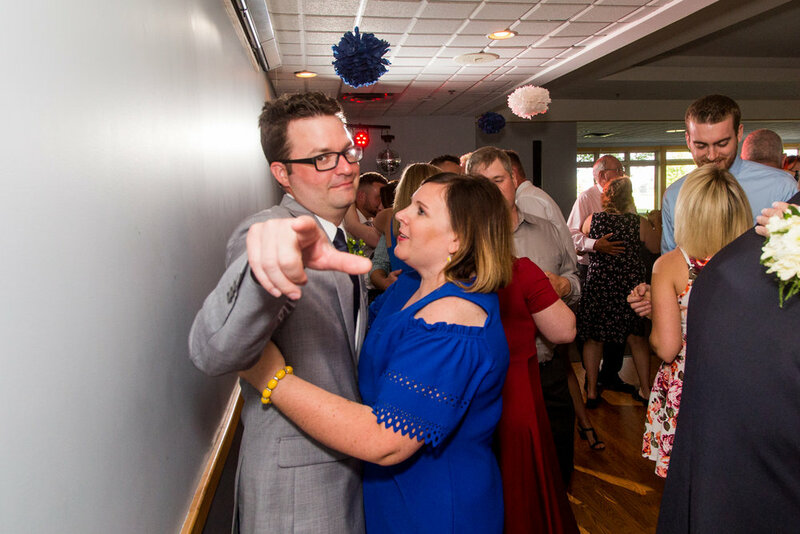 Who better to help take away anxiety on your wedding day than your best friend? With all the pieces in place it was time for the first look. As we work through the shot list of a wedding day, we make sure and capture photos of not only the bride and groom, but also the bridesmaids and groomsmen. These are the people the couple has asked "Will you stand next to me as I get married?". We know the people in the wedding party are some of their closest relationships. With Jeff and Megan's first look complete, we were able to schedule time for wedding party photos. The June weather cooperated and St. Anthony's has quite a bit of green space so we took advantage of the opportunity for outdoor portraits. The first image below is one of our favorites from the wedding day. Megan's father wanted to see her just prior to the ceremony. This is the first look between the two of them. 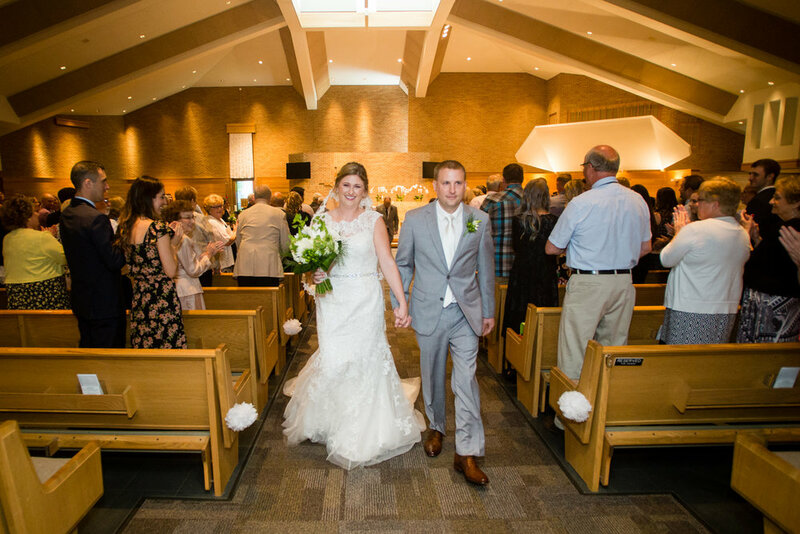 Following the touching moment, it was time for the main event at St. Anthony's, the wedding ceremony. 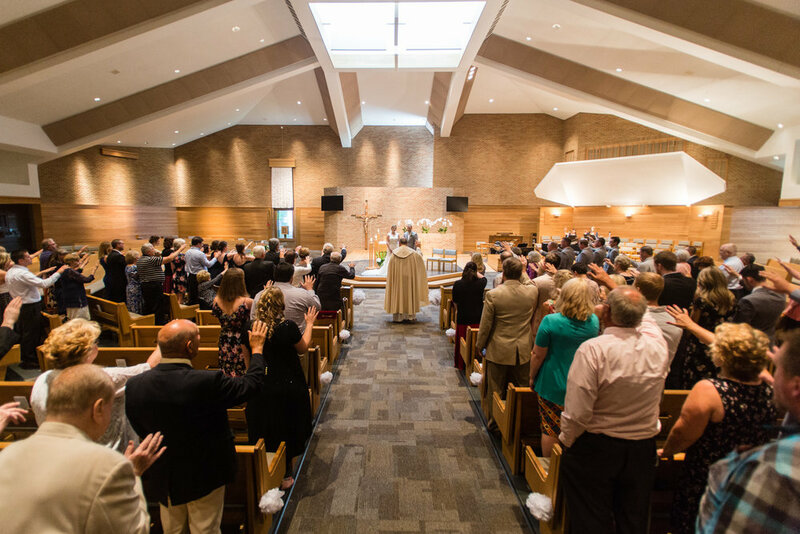 The group that attended the ceremony was treated to a great homily by Father Mark and it will be one that Jeff and Megan never forget. Great family portraits have always been important to us. Perhaps our parents instilled in us the need for family photos by taking us to Olin Mills twice a year. Or perhaps it's the experience of 350+ weddings where we know that someday, couples will want (and need) these portraits to honor a parent, grandparent or sibling who has passed. At some point in the future, you are going to want beautiful portrait of your family. 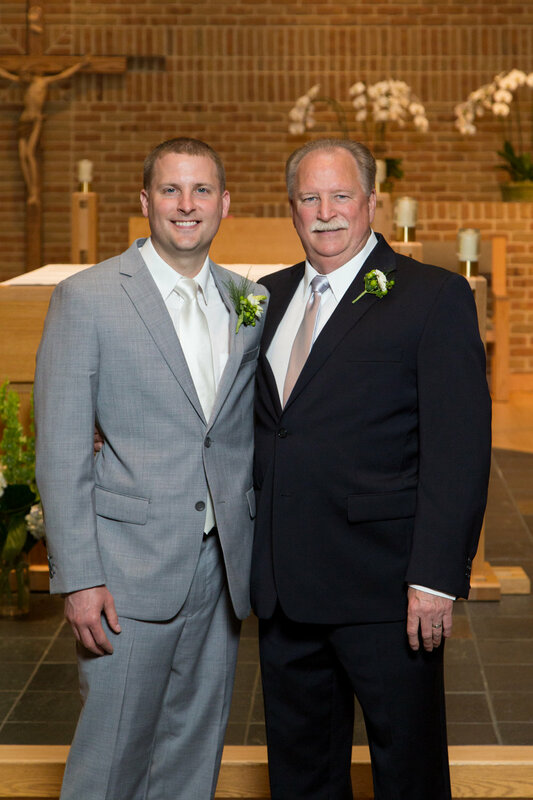 The wedding day offers time for families to take a moment and have beautiful portraits taken. 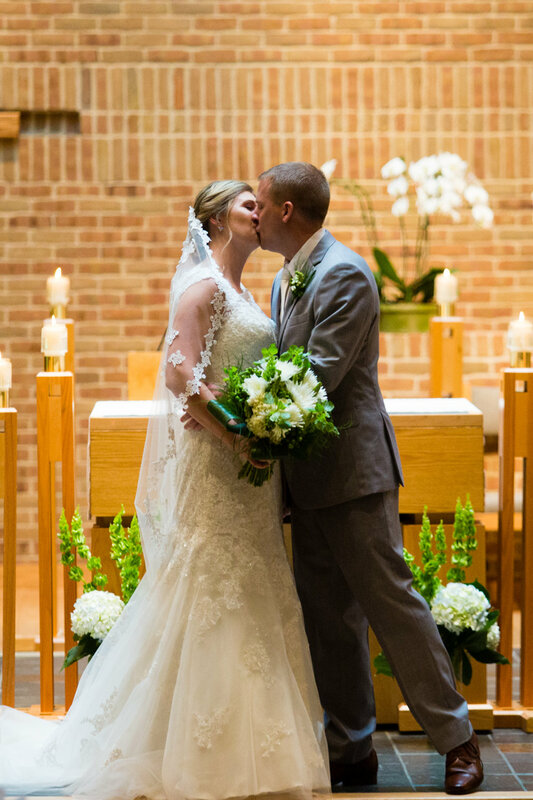 The altar at St. Anthony's is a great location for portraits and with the help of a little bit of lighting on our part, both Jeff and Megan's families looked wonderful! Planning is such a key to the wedding day. Knowing Jeff and Megan wanted time to take photos somewhere "on location" as we planned the day allowed us to schedule time for it. Hopping on the trolley, we headed to downtown Grand Rapids. The first stop was Ah-nab-awen Park and the Gerald R Ford Museum in the downtown area. This location offers great architecture, green space and skyline all in one spot. 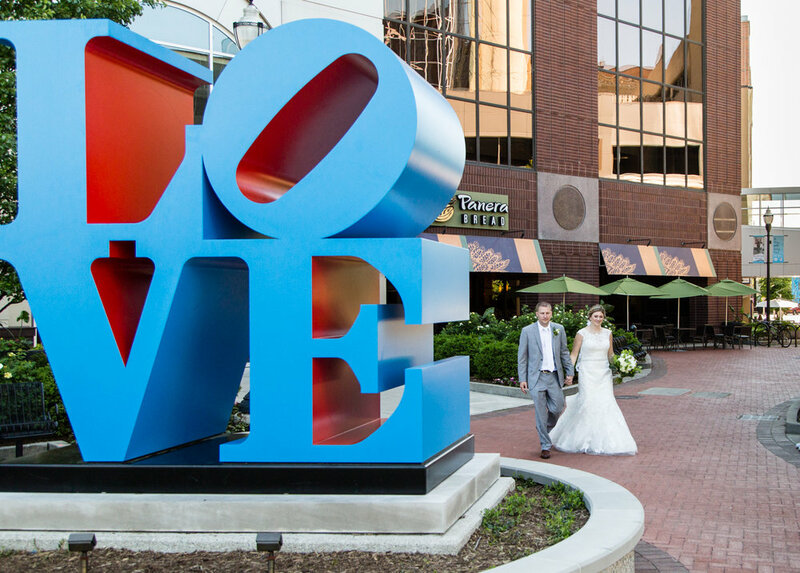 Then it was over to a new sculpture in Grand Rapids, one that will most likely become a wedding day favorite, Robert Indiana's LOVE sculpture. Following time downtown, we headed out onto Boulder Creek Golf Course with a couple of carts to photograph the bride and groom at two different locations as well. The reception is the time when everyone relaxes. Shoulders go down. 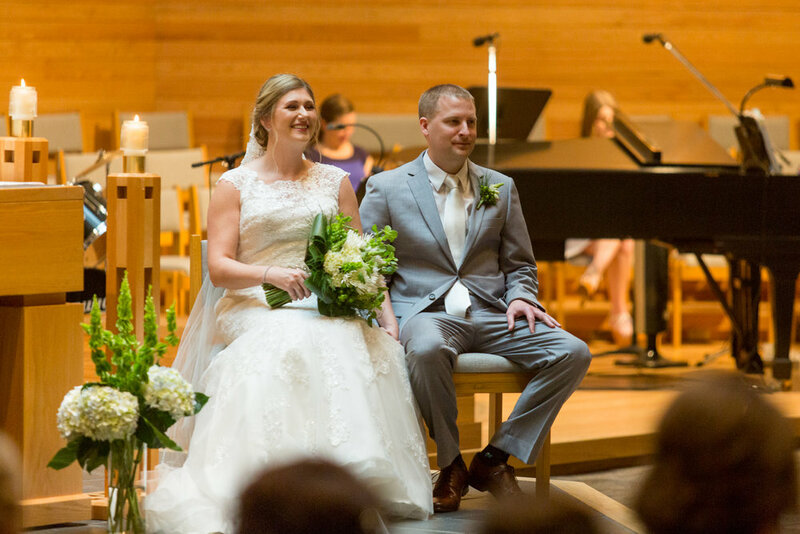 The bride and groom sit back and take in the experience of having all their friends and family gathered around them. 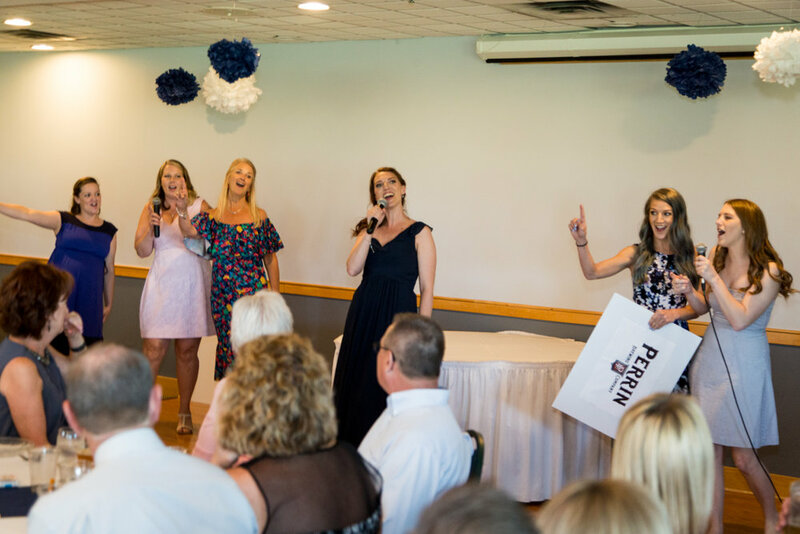 Jeff and Megan's reception at Boulder Creek Golf Club included a matron of honor speech that was sung to the tune of "Girls Just Want To Have Fun", their first dance was played and sung and the dance floor was full all night long. 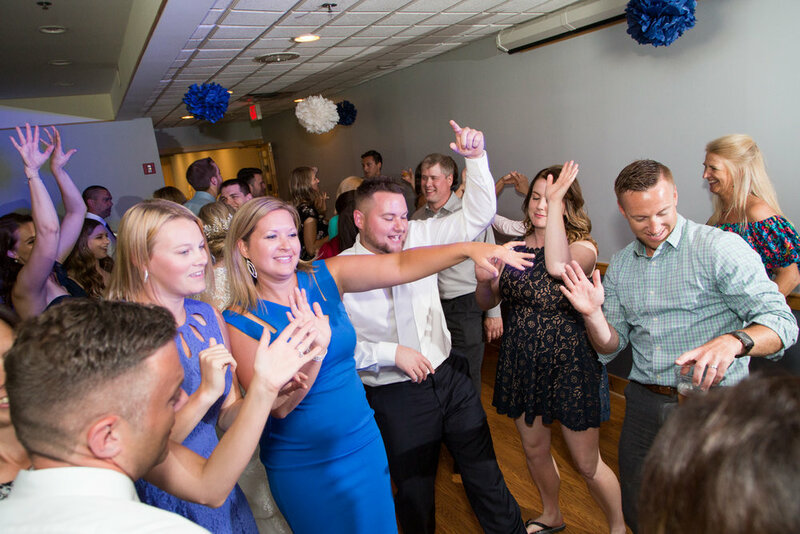 No bouquet toss. No garter toss. No real formalities other than "we are glad everyone came tonight, let's have a great time while we're here!" Love the images you see of Jeff and Megan? Looking for a photographer that can make you feel confident? We would love to connect with you about your photography needs!